Zotero is a free, easy-to-use tool to help you collect, organize, cite + share research. And guess what? Zotero is developed by an independent, non-profit organization that has no financial interest in your private information. With Zotero, you can always stay in control of your data. Get a sneak peek at what a Zotero library looks like. Shannon's Zotero Library is public. Need a quick citation? ZoteroBib helps you build a bibliography without creating an account or installing any software. Enter a URL, ISBN, DOI, or title and generate a citation. 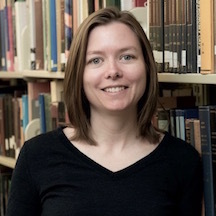 To use Zotero, you need to install both the personal research assistant (your library, an app downloaded to your computer) + the Zotero connector for your browser (an add-on). Zotero works with Firefox, Chrome, and Safari browsers. Use their Quick Start Guide + Screencast Tutorials for assistance. Create a free Zotero account (you do not need to use your Drexel email). The benefits are that you will be able to sync your library to Zotero.org + access it from anywhere. You'll also be able to participate in group libraries. I highly recommend this Self-Guided Zotero Tutorial from Kyle Denlinger, the eLearning Librarian at Wake Forest University. He covers installing Zotero, saving sources, organizing + syncing your library, and generating citations + bibliographies. Proxies DU Libraries requires you to sign-in to a proxy to access electronic resources. This usually isn't a problem with Zotero. If you want the proxy remembered for future visits, accept the proxy. Zotero has support for proxy preferences and folks at the Libraries can help you troubleshoot. Where's My Stuff? As you build your library in Zotero, you may want to have an item in more than one folder. Or, you see the item in your library, but can't remember which folder it's in...seriously, it will happen. To see all the collections (folders) an item is in, select the item and then hold down Control (Windows) or Option (Mac). This will highlight all collections that contain the selected item. To include subcollections (subfolders), expand all collections by click in the collections pane and pressing the + (plus) key. Clean Up Your Stuff You can convert the title and publisher fields to either lower or title case by right-clicking the field and using the Transform Text menu. For instance, "The environment and social behavior" becomes "The Environment and Social Behavior" if I use the title case. Clean up your files with Zotfile, a Zotero plugin to manage your attachments. It automatically renames, moves, and attaches PDFs (or other files) to Zotero items, sync PDFs from your Zotero library to your mobile PDF reader (e.g. an iPad or Android tablet) and extract annotations from PDF files. Like Zotfile? Check out other third-party plugins developed for Zotero users! RSS Feeds Zotero allows you to follow RSS feeds within your library. For example, from the homepage of the Journal of Design Research, click on the RSS for the Latest Issue Contents. Copy the URL, then click on the icon for the New Group/New Feed. From the New Feed, select From URL + paste in your URL. It will update when there are new issues. Like one of the articles in your Feed? Drag it into your library! 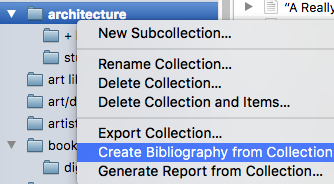 Generate a Bibliography Want to share your resources with someone outside of Zotero? Right click on a folder and select Generate Bibliography from Collection. You might also choose Generate Report. This creates a report that includes all the information for each item such as abstracts, URLs, your notes, and keywords + tags. Writing in Google Docs? There is a Zotero Connector tab in your Doc menu. 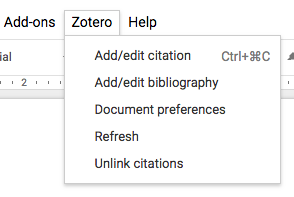 Search for items in your Zotero library and insert citations. When you're done writing, you can insert a formatted bibliography with a single click! Learn more. Writing in Microsoft Word? Zotero's installation includes a word processor plugin for Word and LibreOffice. In the latest few versions of Word, it's a tab in the software. In earlier versions of Word, it's under the script menu. Zotero has Word Processor Plugin support.